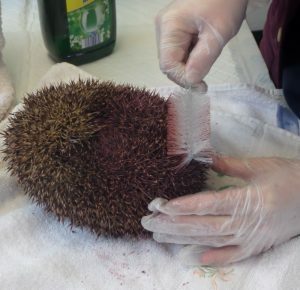 Firstly, make sure you are safe from whatever is contaminating the hedgehog. 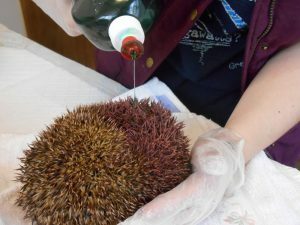 rubber gloves are OK, but the prickles will pop through them, so we recommend a stout pair of old leather or garden gloves over the top of your rubber ones. 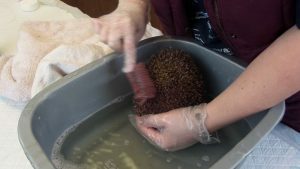 If you know what is covering your hedgehog, such as engine oil, paint, woodstain and it is safe to handle, you can have a go at cleaning him up. If you suspect the substance may be toxic or harmful then seek professional help from a vet immediately. 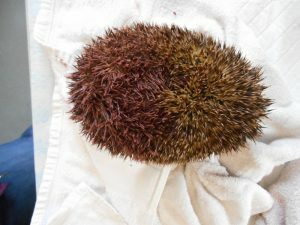 The first thing to do is to check the hedgehog has none of the substance in his mouth or eyes, have a look at our “uncurling a hedgehog” video for some tips on how to do this. 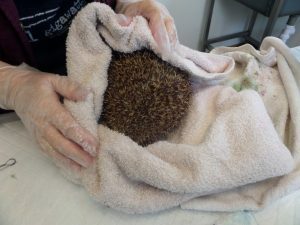 If he has swallowed any, or has any in his eyes he will need to see a vet for some anti-poisoning therapy. Do your best to remove the substance from nose, mouth and eyes with a dry cotton wool pad or cotton bud, be very gentle around the eye area and get to the vet ASAP. Liberally apply neat washing up liquid to the affected area. Do NOT use thinners, swarfega or other substances. Use a wet (warm water) synthetic brush to gently work it into the spines, such as an old toothbrush or baby bottle brush. Lower the affected area into a warm bowl of water and continue to add more washing liquid and brushing until the substance is gone. 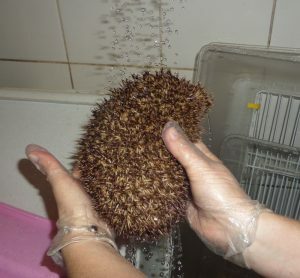 Rinse the hedgehog in WARM running water to make sure there is no trace of soap left. Keep warm until completely dry. 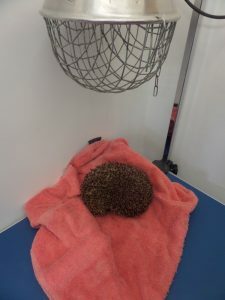 This hedgehog is under a heat lamp but a hot water bottle will be fine!